Having the brief life sketch by Maurice Cardiff as fuel for thought, supplemented by the subject's own words in the form of a posthumously published Note Book of his thoughts, it becomes obvious that the man who became known to the Buddhist world as Bhikkhu Ñanamoli was a complex and ambiguous person. On the one hand, a deep and careful thinker, always seeking a more complete understanding of whatever subject he was examining, and on the other, a playful and merry mischief-maker, someone who delighted in coming up with word puns and other playful tricks which kept his always curious mind in motion. He was at once, a very capable person - able to learn new languages, or just about anything, without much study at all - and just the right person for the important work he eventually undertook as his life's work, that of a tireless translator of the Buddhist Pali scriptures and commentarial works into the English language. Because he possessed an extreme intelligence and displayed a skill with language, he was able to accomplish in half the time what lesser men accomplish in a whole lifetime of similar work, and to do it with a scholarship and accuracy that has stood the test of time. "Every act is an act of forgetting - forgetting some constituent state and composing some new one." "Feeling as the ruins of past actions, and Craving as the jungle that overgrows them - clear the jungle and the 3 feelings will become clearer." 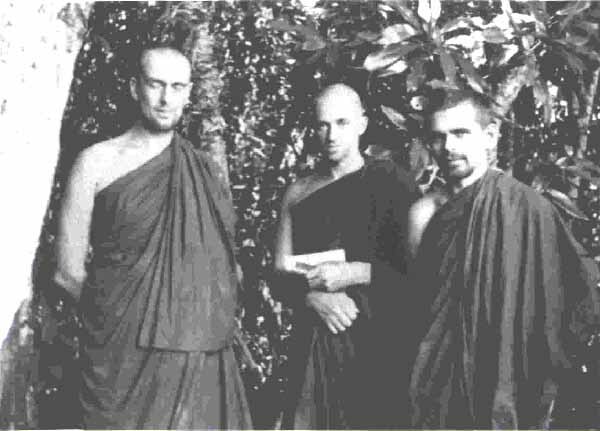 In considering the life of Ñanamoli Thera and the significance it had on the development of the Dhamma in the West it is safe to say that his translations, which were his major contribution to the Buddhasasana in the West, helped to get into the hands of serious practitioners needed information from the voluminous writings on hand in the Pali Canon. What is important here is that his translations were based upon his understanding as a fellow practitioner, an ordained member of the Sangha who was fluent in English and was able to communicate the nuances of the scripture and commentarial writings without the usual difficulties that non-native speakers of English have in making this attempt. The tremendous importance of this cannot be over-emphasized. She wore, as always, a coat and skirt of a material which closely resembled hessian, and a hat seemingly modeled on a man's bowler. Though reputed to have been a great beauty in her day, she had clearly let her looks go, particularly in regard to her teeth of which one yellowing survivor was permanently and prominently visible. The daughter of an American father and a German mother, and brought up mostly in France and Italy, she had a slight foreign accent, and there was a touch of continental formality in the manner in which she received us. It was evident, too, when she turned to introduce a tall young man who, standing in the shadows at one end of the hall, was so obscurely present that he might have been confused with the figures in the tapestry on the wall behind him. Now he stepped forward but stopped short of the circle round the fire, responding with a slight bow to her bald statement - although her guest of some years she had never been known to address him other than by his surname - "This is Mr Moore." He had bought the harpsichord - early eighteenth century in a splendid walnut case - six months before. His friends had been astonished as he was not at all well-off and it had seemed an uncharacteristic extravagance. Besides, though known to be knowledgeable about music, he had never studied the piano or any other instrument. Confident that he could teach himself, he had learnt to play remarkably quickly and with considerable skill. He spoke, too, of his personality, of his detachment - so much at one with the teaching of the Buddha - which seemed to have been inherent in his nature; but, also, of his compassion, evident in the friendly smile he had for all who approached him. He had lent ready and effective help in practical matters when called upon and had been generous in giving advice and guidance to the younger monks in their studies. It was in the shop that I met him for the first time. Basil was discussing a delivered piece of furniture with Leonard Huskinson, a large and ebullient friend. Between them they seemed to be taking up most of the premises' limited space. Not until Leonard turned to ask for his opinion did I become aware of Bertie's presence, standing, as he was, silent, motionless and as much into the background as was possible. This state of withdrawal, this all-but-absence, habitual to him, arose as I was to learn, partly from shyness but also because, contemplative by nature, he felt most at ease as a detached observer of a situation or as a listener-in - rarely participating unless pressed - to a debate. This last may have had a special appeal for him since he had a love of the sea from his island upbringing. According to Basil who had experience of it when staying with him at his family home on Tresco, it brought out an unexpected, dare-devil streak in his character. In weather blustery enough to make Basil apprehensive, Bertie and his father took him for an outing in the Moore's sailing dinghy. Clear of the harbour, the sea proved to be rough and grew steadily rougher as the wind strengthened. Undeterred, with Bertle growing more exhilarated as the waves rose higher, his father - described by Basil as a 'kind of retired buccaneer' - headed the boat so far out that when they turned round, the land was only dimly in sight. But worse was to come. As they neared the harbour, the wind drove them towards some rocks. The closer they approached to disaster, the more elated Bertie became as he and his father struggled to head the boat out to sea. Their last minute success, followed by perilous tacking to regain the harbour, left Basil severely shaken while for father and son it had evidently been no more than an invigorating and challenging adventure. The insecurity coincided with and may have been partly caused by Mrs Feilding's death. She had made herself ill by insisting on going out in the worst of Otmoor weather to feed the numerous cats which haunted the topiary. Reluctantly forced to take to her bed and still wearing her man's bowler - for this and what follows I rely upon the account given me by her daughter, Susan - her condition so deteriorated that, despite her protests, a doctor was sent for. He diagnosed pneumonia, prescribed medicines and advised that her bedroom window, which she always kept open, should be shut. As soon as she was left alone she picked up a large book from beside her bed and hurled it at the window breaking some of the leaded panes. The Otmoor fog, once again in its role as the angel of death, rolled in and while the family were playing cards downstairs in the hall, she died. Despite these distractions it appears in his later letters, particularly in one dated 13th of July, that he is becoming increasingly unsettled in his work and the responsibilities it entails. In that letter, after a disparaging account of Lord Grimthorp's garden at Ravello, he mentions that he is reading 'the best treatise on Buddhism he has so far come across written in Italian by a man called Evola - a remarkably clear, objective and complete exposé of the subject.' Although he does not refer to it again in subsequent letters, its influence on him must have been very strong, for it came close to bringing his army career to a disastrous end. "Oh, you must mean Bertie! I had no idea his name was Osbert. It sounds too pretentious - not like him at all. How is he? What's he doing?" The original hermitage is covered with a forest jungle of mangroves, palms, creepers and what not amongst which are seven isolated 'houses' (one room each) and a refectory. Madiduwa is more open and covered with cinnamon bushes and coconut palms. Both are surrounded and the causeway arched over with a narrow belt of mangroves ... The lake is large, about two-and-a-half miles across and brackish as it connects with the sea. It is entirely surrounded by hillocks covered with coconut palms. A huge colony of cranes which spend the night feeding in the countryside among the rice fields, roost by day and squawk in the island mangroves. Iguanas wander among the bushes, some three feet long and oddly prehistoric-looking, whilst similar looking water lizards swim in the lake. Large birds whoop and shriek and small birds sing rather saccharine and sentimental songs - often, indeed, tunes rather than songs. Drums beat for long periods from many places on the mainland, sometimes all night and sometimes all day, with complicated rhythms. All day from the nearest mainland comes the monotonous pounding of coconut husks being beaten into fibre. 'In the afternoon one sleeps for a bit, bathes in the lake and meditates afterwards. At seven or so there is tea in the refectory for anyone who wants to go there. Here one has cups of tea and lemon and talks of doctrine with the monks, or Pali discourses are recited. It is dark at this time and the refectory is open on two sides to the air. Strangely when the doctrine is discussed or Pali recited, large toads come out on to the floor to listen, their large golden eyes unblinking. When it is over they go away. The atmosphere is almost Franciscan, especially when the rain roars so loud that you have to shout to be heard and the feeble light of naked oil wicks is drowned by the almost continuous blue lightning accompanied by the crashing of thunder - or again on one of those incredibly grandiose nights of the full moon when soft strong fight streams down through the dense trees. 'From there it is about a quarter of a mile to the sacred Bodhi tree ... half-way between was a huge temporary open pavilion in the centre of which a kind of roofed ornamental rotunda filled with monks taking part in a non-stop recitation of scriptures which had lasted for a month all day and all night. As they recited amid a blaze of coloured electric fairy lamps, the rotunda rotated slowly and the recitations were laid on through loudspeakers. The effect was peculiar and indigestible ... I was not sorry to leave Anuradhapura, impressive as the miles of ruins are and the parks and the great lakes and the three enormous stupa domes.' They went on to Mihintale nine miles away where, according to legend, the Emperor's son alighted after his miraculous flight through the air from India. He finds the monastery, seven hundred steps up a granite staircase 'a rather wretched recent building bordering on hovel architecture - rich and mean, important, hearty and busy, hospitable and worldly.' They spend the next day exploring the ruins. They set out to walk back to Anuradhapura towards evening by a little frequented jungle track. 'The road for some miles is quite deserted and shut in on both sides by the monotonous jungle - the jungle which is so easy to get into and so hard to get out of. Where visibility is reduced to about ten yards. By day it is hot, airless and dry. There is an uneasy sense of being watched or just observed with indifference or verging, perhaps, on dislike. No Sinhalese will go into it without first breaking off a green branch and hanging it on a tree as a placative measure and there are tree shrines and ant-hill shrines near jungle villages or on lonely roads which no particular religion will own. It is quite quiet except for some occasional hidden bird that warbles off and on with the sweet voice of a concert flute blown by an idiot child, or, rarely, a slight rustle is caused by something always out of sight ... Sometimes there is a tree with a greasy patch high up on its trunk where elephants rub themselves. Or one comes across an isolated tall tree full of cicadas scraping out loud rhythmic music, as dry and tuneless as a Bartok quartet, to an audience which isn't there. Rarely a troop of monkeys crashes through the branches and fling sticks and abuse at one as they pass, but this only underlines the normal tone of closeness, suspense and commonplaceness. 'To get to the place I had to go by bus eight miles beyond Hambantota and then walk two miles in the uninhabited jungle to a high rock which stands above the tree tops about one hundred feet. There are three ruined brick shrines on top and a lot of ruined stone buildings on the sides where there are also deep pools of water. At the bottom on one side there are two caves in one of which I stayed. The nearest houses were two miles away along the road. Each night elephants and tortoises and other things left their footprints in the jungle track. I saw a wild deer and some jackals and a very big gorged python under a tree (incredible sight!) and a peacock in flight (there were lots of them screaming rather royally, musically and triumphantly in the jungle). Also I caught a glimpse of a tusker elephant one evening in the dusk. Hornbills in the trees, too, as big as geese (their heads are too big for their bodies and their bodies for their tails so that when they perch on a branch they first topple forward and only right themselves with unseemly antics) and lots of monkeys. At night huge black scorpions would creep out of their houses (holes in the ground) and sit outside their doorsteps waiting for something to happen. In the morning lovely pink-plush mites walked about looking for guidance, alone or one following another or in little files of three or four like large animated wild strawberries ... There was a most improbable view from the top of the rock, just the view, exactly, that a fly must get when it sits on one of the things in a Palissy-ware plate - all mossy looking jungle with a complete six or seven mile distant rim just like a plate. Beyond the rim (in an altogether other world, nothing to do with me at all) was the whole range of the Ceylon mountains to the north and east ... and to the south, over the rim, a small strip of salt-pan and then the ocean ... My plate, which hypnotized me, was nothing but a mossy mass of jungle crawling with living things (some enormous), ringing with birds, heavily scented with several sorts of jasmine and jungle flowers ... all the plants blooming away after the rain and trying their best to strangle each other, animals whooping like demons and tearing each other to bits and millions of birds singing away like lunatic angels. Nature seems to me on such occasions like a mad ogress in a flowery cotton-print crinoline frock and spring hat. She is quite horrible, isn't she? and as fascinating as one of her painted vipers is to a painted bird. The news that Susan's son, Robert, has become a convert to Catholicism and, later, that he is to enter the Dominican order revives his old prejudice against the Catholic Church. The only attraction it has ever had for him is in 'its decorative grandeur, emotional glamour and thrill of mystery.' But he has 'always been unable to perform the sacrifice of reason on the altar of emotion which the Church demands, mainly because it disgusts me.' He cannot stomach St Thomas Aquinas' philosophy which 'seems to me to have an alien, oppressive and unsatisfactory, smartish taste.' While he finds papal infallibility and the bodily assumption 'not only absurd but in bad style,' he is strongly against the taking of irrevocable vows as imposed by the Church. In Buddhism no such vows are demanded. After reading the Ceylon letters and with Nyanaponika's eulogy still in mind, I felt that the subject of whom I had set out to write this account, had developed two quite different personalities: the one, hard-hearted, cynical, astringent, gossipy and not without malice (so very different from the character we had known or thought we had known in the past - withdrawn in his shy friendliness and retiringly modest though so erudite and many gifted); the other (not at all at odds with what we might have then conceived - for there was always a touch of the monastic about him - as his eventual destiny), the exemplary monk and dedicated scholar only breaking off from elucidation of obscure texts to make pilgrimages to remote jungle sanctuaries, impressing those he travelled or met with by his piety and equable temperament and always observant of the nature around him while equally sympathetic to whatever creatures, commonplace, exotic or even venomous, he encountered. born Osbert Moore, (1905-March 8, 1960) was a British Theravada Buddhist monk and Pali scholar, educated at Exeter College, Oxford.